Activate Purpose - Episode 17 - I’m Back From My Hiatus! Hi. I'm Victoria Hefty. Welcome to Activate Purpose where I talk about finding purpose through action while balancing motherhood and career. 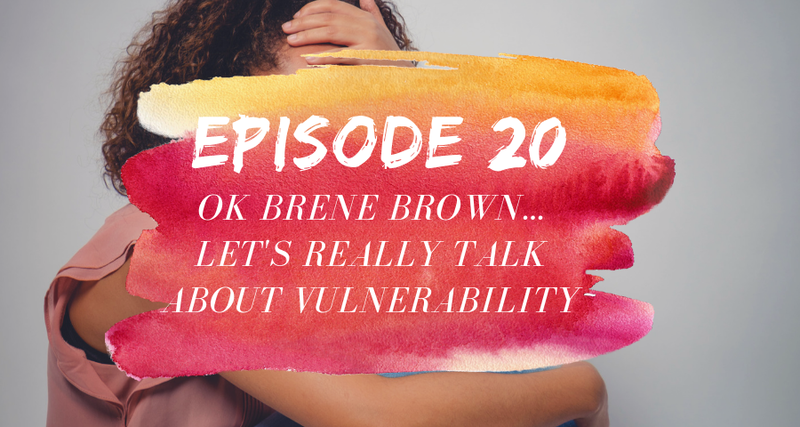 In today's episode, I'm going to talk about vulnerability and share why I have been feeling especially vulnerable these past few weeks. I don't have some big epiphany to share on how to overcome this feeling, but I do think sharing my struggles will give you an honest behind-the-scenes view of what I've been thinking about lately. Let's begin with defining what it means to be vulnerable. According to Merriam Webster, to be vulnerable is to be either, one, capable of being physically or emotionally wounded or, two, open to attack or damage. Ever since Brene Brown did her talk on the power of vulnerability, it's a TED Talk, I swear I can't read a leadership article or business article without someone mentioning how important it is for leaders to feel vulnerable or to express vulnerability. If you haven't seen that TED talk, by the way, I'll include a link in the show notes. I've watched it a few times. I love it, and, actually, as of today, Brene's talk has over 36 million views, so, clearly, this is something that other people are either interested in or struggling with, as well. The thing is I believe it's easier to talk about feeling vulnerable after you have overcome whatever that thing is that caused you to be vulnerable in the first place. Let me explain. Feeling vulnerable, for example, about telling your new girlfriend or boyfriend that you love them or putting yourself out there and asking for promotion or maybe even starting your own business, these are some of the examples that I think people use when they say that they're feeling vulnerable about something, but, most of the times, we only ever hear from these people who have actually successfully overcome this fear, but what about when you're right in the thick of it, meaning feeling vulnerable and you don't really have a clear way out, and that's where I'm currently at. As I mentioned in episode 17, I'm expecting my second child, and this pregnancy has been much more difficult than the first. While I'm sure, obviously, pregnancy hormones are contributing to my feelings of vulnerability, among other things, but we won't go into that, I don't think that the hormones are the real cause of this feeling. They're just making it a lot worse. I'll share some of the things again that I'm struggling with. Actually, specifically, I'll share two things. One, feeling like I'm not living up to my full potential. I don't know whether, again, it's my type A personality or whether I'm just being way too hard on myself, but I've started to lately feel like I'm not living up to this potential that I've set for myself, and I'm not even sure if I can quantify what that potential is. I just feel like I'm not there or even close to there, and if I'm being 100% honest with myself, a lot of this feeling has to do with comparing my success thus far and journey to those of my peers. I talked about jealousy in episode 14, but this is different. It's not about liking someone or, as they say, hating on another person because of that person's success. It's not that outward-facing. Instead, it's more like I've begun to internalize other people's success as a sign that something is wrong with me, that I'm doing something wrong, that I'm just not capable enough, and I'll give you an example. After I got my MBA from the University of Chicago, I became a management consultant, like many of my classmates. That was seven years ago, which is actually crazy to think about, by the way, but, now, many of those classmates, some of who are my dear friends, are still consultants at the principle level and are now approaching partner level or they're announcing that they have recently become partners at their firms. While I'm obviously happy for them, I sometimes get this sinking knot in my stomach when I either hear or read about their promotions. It's not jealousy because they've worked really hard, but, rather, in my mind, it's actually something worse. It's a feeling of inadequacy, a feeling of fear, a feeling that even though I have zero or maybe close to zero regrets about following my own path, there's a fear that this path won't lead to some big, magical success story that I can look back on fondly, but will instead just slowly peter out, and that's kind of hard to admit. It's actually really hard for me to admit because I always like to stay positive and say, "This will work out. I will will it to work out," but this little voice in the back of my head sometimes or, like I said, that sinking knot in my stomach is like, "But what if you don't, Victoria? What if this thing never ... What if you don't become 'this big success' that you have in your mind that you think is possible? What if it just doesn't happen," because, let's be honest, there's so many entrepreneurs or life coaches or life strategists, whatever the new term is, out there, telling people, "Quit ... Quit your job, quit your corporate job, follow your passion, and only then will you find true success," but the reality is just so much more complicated than that. There's so many factors that go into what makes someone successful, and even on my best days, when things are ... my consulting project is going great or I booked a large client, I'm feeling really great about my podcast or my book or being a mom, there's still this small feeling of this imposter syndrome, which is why I try to be candid on this podcast. Even then, when all these things are going well, I don't know, I'm still human, and I don't like feeling vulnerable on this show because, who wants to hear from someone who has no clue what they're doing, right? At least I usually don't, even though I'm that person. I sometimes ... Actually, a lot of times, I feel like I don't know what I'm doing, and that's a sense of imposter syndrome I'm talking about as I try to be very clear when I'm on this podcast, sharing how I feel and some resources that I'm using, but, I don't know, it's a balancing act because I don't want to pretend that I have this all figured out because I don't, and some days, it feels like, what is my end goal again? Why am I doing this? The only thing I can say is I'm doing it because I enjoy it. I still feel compelled to do it, and, for now, I guess that that's good enough, but, like I said, it doesn't take that feeling of vulnerability away of just because it feels good and I'm excited about it doesn't mean it's actually going to end up being this thing that is "successful". I will say this to my ... No, I was actually ... Sorry. I will say this to myself. I need to trust in my journey and not anchor on these fancy corporate titles of my peers. Yes, partner, don't get me wrong. It does sound really nice, but I also know that it comes with strings attached that were and actually even now are not compatible with the life I want. It's just really hard to remember that sometimes. I'm sure you guys can relate. It's like I don't necessarily want that life, but I want to cherry pick aspects of that life and have the title, but not have the stress that comes with it. I don't know. Maybe it's just me, but I am just really struggling with that, so I do have to remember that it's important to trust that I did this for a reason, trust in that journey, and, again, not compare my path to someone else's, and especially not compare my path because of a title. I don't know how my friends ... Who knows what they're actually going through? They may have the title partner, but not be happy or also having a sense of feeling vulnerable and wanting to get out or not feeling like a success. I don't know. That's something that I actually need to talk to them about, and maybe I think a good followup episode would be getting the other perspective, so I will actually write that down and maybe come back to that. Another thing that I've been struggling with is an idea that actually came to me recently. It may be in the last week or so, maybe one to two weeks, I'd say, but as soon as it came to me, I came up with a list of reasons why it was dumb, and I pushed it in the back of my head pretty much immediately. I was like, "Nope, sounds good in theory, never gonna happen," and that was the end of it. The fear definitely won out on that one, super quick, which is unusual for me, but that's what happened. What's the idea? Well, I was talking to a couple of other moms about this notion of feeling stuck in life and why a lot of new mothers, like me, were not prepared to feel that way after motherhood. We all had great careers. We got married, and then motherhood was supposed to be this thing that completed the picture, but it didn't. Don't get me wrong. We love our children. We love being mothers, but there is a shift in defining who we are without somehow having to incorporate this work aspect into it. I think as a culture, as a society, we fixate on, are you a working mom? Are you a stay-at-home mom? Are you a work-at-home mom? But whatever happened to just good old Victoria? What do I enjoy? What do I want to explore, or as I talked about in episode 19, what am I curious about? The idea was, what if I ran this very small, in-person workshop where I found a bunch of moms who could come together and start tackling that very question of, who are we? What do we want to explore? What are we curious about? The key is that I didn't want there to be some sort of big business idea, epiphany or career change at the end of the workshop. The goal isn't to, okay, I've found this thing that I'm curious about and, therefore, I'm going to quit my job at the end of the workshop, but, rather, it's to get a better understanding of who we are and how we can tap into that more so that our lives can be more fulfilled. The problem is every time I start to think of doing something about this new idea, I literally freeze. For some reason, to me, it's not like writing a blog or a book, where I can stand behind a product. I am the product in many ways, and even worse, I feel like I don't have the answers, so what the heck am I doing trying to run a workshop? I'm still trying to figure out this all by myself, and I don't know if it's imposter syndrome, I don't know if it's a vulnerability of saying, "I would love to run this workshop and let us solve it together," but I don't have the confidence to lead other people in an area that I don't feel like I'm "an expert" in. I don't know. I just get really nervous about putting myself out there and exposing myself to these women who potentially would be looking to me for the answers, and I don't know if that is my place right now. I think it's a fair question. Should I be ... Is it that I'm letting fear win out, or am I actually trying to respect their time and effort if they did this workshop and provide them with real answers? I'm not sure, but I do know that because I've pushed it out of my mind rather quickly and then it, obviously, creeps back, I start to get angry at myself because I feel like with that mentality, if it's the fear side rather, I'll never be truly successful, and then it goes down from there. It's like, "Okay. Well, if you can't even do that, then why are you doing any of this stuff," and then I just ... I start to get really hard on myself, which, again, if you've listened to this podcast, is not my personality, but something about this is, I think, particularly vulnerable, and so, for now, I've blocked it out. I literally am just like, "Nope. I can't. I can't think about it." Like I said in the beginning, I told you, this wasn't going to be an episode with some aha moment of, oh, Victoria's got it figured out. Nope, I am right in the thick of feeling vulnerable, I don't have a clear way out, but you know what? This is real life. I can promise you that I will continue to be honest in my journey and hope that it makes you feel less alone if you're struggling with the same feelings I am. My challenge for you today is to get honest about what makes you feel vulnerable, not what made you feel vulnerable in the past, but, instead, what is making you feel vulnerable right now? What gives you that sinking feeling in your stomach that I was talking about? Ask yourself, what is behind that feeling, and either talk about it, or I actually think that it's more powerful, write it down. Bookmark it. Send yourself an email, whatever. Just save it. I'm going to come back to this topic in a future episode, and we can both look back and see if our feelings of vulnerability have strengthened, have they weakened, or have they stayed the same? Again, the objective isn't to overcome this vulnerability magically, but rather to acknowledge the feeling in all of its messy glory and, hopefully, together, we can both come out on the other side whenever that happens. If you have any advice for me, I would love it, or if you just want to share what you've been struggling with privately, you can email me at victoria@activatepurpose.com. Again, I'll include links to the Brene TED Talk I was talking about earlier and the previous episodes I mentioned in the show notes, which you can find at activatepurpose.com/episode20.